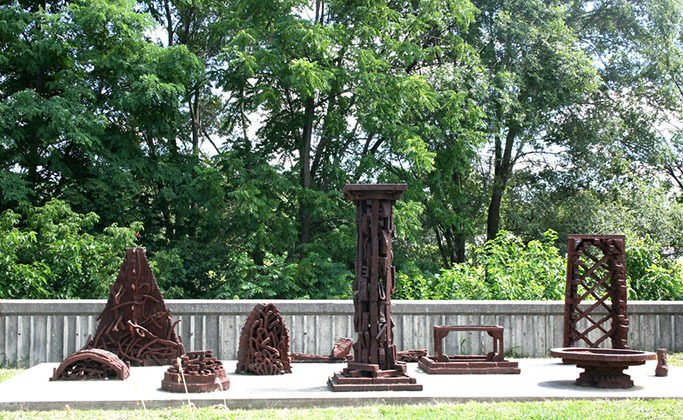 The Cambridge Sculpture Garden (CSG) may very well be Cambridge, Ontario’s best kept secret. Nestled along the historic Grand River and joining the Trans Canada Trail, the CSG offers a central oasis to picnic, walk, contemplate or participate in our ‘scare the crow’ October family event. Come and enjoy the sculptures in the garden at Grand Avenue South and along the river walk in the heart of downtown Galt City Centre. The garden is always open. Admission to the sculpture garden and event participation is free. We are a volunteer committee and registered charity, dedicated to enhancing and preserving this green space which we developed in downtown Galt. We present both temporary and permanent sculpture in the garden and along the river walk.